In the Spring of 1967, Jack C. Spanner and Allen T. Green observed that a number of researchers were investigating the phenomenon of AE and publishing reports of their work, but there seemed to be a lack of centralized communication. Spanner also observed that there were differences in terminology and experimental techniques, generally reflecting the researcher's educational background and technical expertise. Jointly, Spanner and Green perceived the need to unite and organize these people for the purpose of compiling and exchanging information. Using the constitution and bylaws of the Western Regional Strain Gage Committee as a model (as suggested by Green), Spanner laid the groundwork for the formation of the Acoustic Emission Working Group (AEWG). Spanner contacted a dozen people with interest or experience in the field of AE and invited them to participate in the formation and organization of the working group. An informal meeting was subsequently held in the King's room of the Esquire Inn Motel in Alcoa, TN, Nov. 2, 1967. Twelve persons attended this formative meeting of the AEWG. In addition to Spanner and Green were Harvey L. Balderston, Harold L. Dunegan, Julian R. Frederick, Philip H. Hutton, Robert W. Moss, Charles w. Musser, Dwight L. Parry, Herb N. Pederson, Bradford H. Schofield, and Norman K. Sowards. 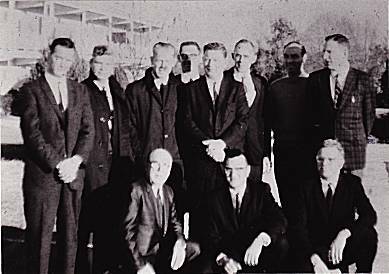 The first meeting of the AEWG was held in Idaho Falls, ID, Feb. 8, 1968. At this meeting, in addition to the founding members, eight persons were elected to form the charter membership. They were T. Theodore Anderson, Thomas F. Drouillard, Robert B. Engle, Robert G. Liptai, D. K. Mitchell, R. Neal Ord, Ronald E. Ringsmith, and Richard K. Steele. The photo is from the AEWG formative meeting; top, from left Robert Moss. Boeing Scientific Research Lab. (Seattle) ·deceased; Dwight Parry, Phillips Petroleum (Idaho Falls); Norm K. Sowards, Same; Harold Dunegan, Lawrence Radillion Lab. (Livermore); Brad H. Schofield, Teledyne Materials Research. (Waltham); Phil H. Hutton. Battelle Northwest (Richland); Allen Green. Aerojet-General Corp. (Sacramento); Herb N. Pederson. Battelle-Northwest (Richland); bottom, from left; Charles Musser, Boeing Michaud (New Orleans)- deceased; Jack Spanner, Battelle-Northwest (Richland)· Julian Frederick. Univ. of Michigan (Ann Arbor) -deceased; Not in picture, Harvey Balderson. Boeing Commercial Aircraft; deceased. Baldemm took this picture. Also invited to the meeting, but not attended: C. Hartbower, Aerojet-General. W .R. Sturrock. Boeing. C. Tatto, Lawrence Radiation Lab.